Accomplished Brazilian singer Leandra will captivate you with her rich, soulful voice. With Jonathan on guitar, she brings the music of Brazil to your event with a repertoire of bossa nova, sambas old and new, pop, jazz and beautiful original songs. We had many guests from Brazil ... it made them all feel like they had a slice of home culture at a London wedding! Absolutely fantastic Duo! Brilliant voice, playing and presentation. Perfect for our wedding. Leandra is a London based singer/songwriter originally from São Paulo, Brazil. 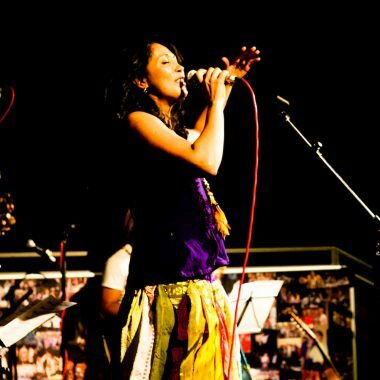 Possessing a captivating voice full of warmth, vitality and Brazilian soul, she sings a repertoire encompassing classics of bossa nova, sambas old and new, pop, jazz and beautiful original songs. 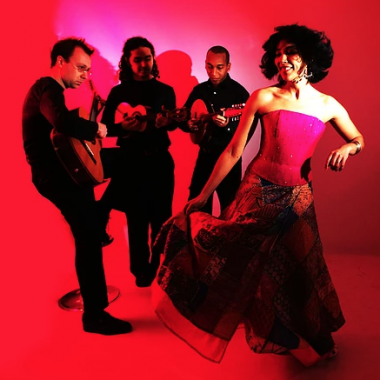 A vibrant stage presence, whether singing laid-back bossa novas with acoustic guitar on a sultry afternoon, or leading a full samba band and filling the dancefloor all night, Leandra brings enormous experience and versatility to any event. Having paid her musical dues singing in numerous bars and clubs in São Paulo, over the last 10 years Leandra has built a superb reputation in UK performing both in concert and for private events. Landmark venues and festivals where Leandra has performed have included Kensington Palace, the Royal Festival Hall, City Hall London, the Eden Project, the Welsh Proms, Brazilian Embassy, Carnival del Pueblo, the Victoria and Albert Museum, Wembley Stadium, Park Lane Hilton and the Dorchester Hotel. She’s also performed on BBC One and – performing live from the London 2012 Olympic Park – on BBC Radio 5live. Leandra’s accompanist Jonathan Preiss is a tremendously versatile guitarist, equally at home performing playing Brazilian music, jazz, musical theatre, classical music or baroque concertos. Specialising in authentic Brazilian guitar, he has played with numerous Brazilian artists including Monica Vasconcelos, Henrique Cazes, Rogerio Souza, Dirceu Leite and Paraiso School of Samba. Jonathan’s live credits include London Philharmonic Orchestra [Lord of the Rings Symphony, Royal Albert Hall], Warehouse Ensemble [Boulez in Birmingham 2008] and Zorro the Musical [Garrick Theatre, London 2008]. Broadcasts include BBC Radio 2’s “Friday Night Is Music Night”. Recordings include “The Hobbit: An Unexpected Journey” and Aled Jones’ “The Christmas Album”. Jonathan is also an arranger and orchestrator with credits including live and recorded arrangements for Michael Ball, Aled Jones, and Mitch Winehouse.